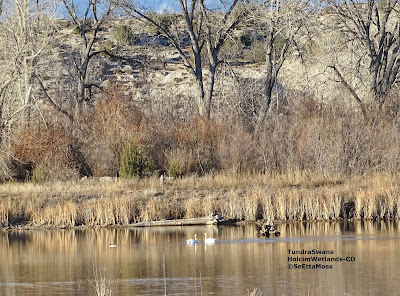 We rarely get swans of any type in the Canon City area, the last were a few years ago. 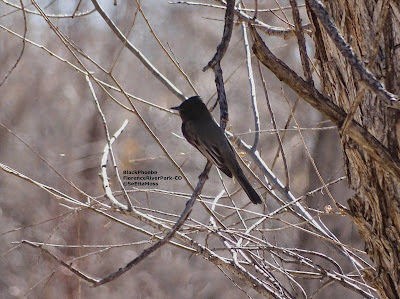 So it was nice to hear that a local birder had found two at the Holcim Wetlands just east of Florence. I was out of town all day so stopped by in the afternoon as I drove back. I was pleased to spot the two of swans flying back in to the wetlands after looking as much as possible with most of the trail still not repaired and off limits. I guess they might have been off somewhere feeding and were now returning for the night. Thought I was photographing swans landing so was surprised to find this Canada Goose had photo-bombed on of the pics. This swan landing shows that swans are not always the graceful looking birds they are said to be. Also while I was counting birds for the Great Backyard Bird Count in Florence River Park I spotted two young Golden Eagles flying near each other overhead. 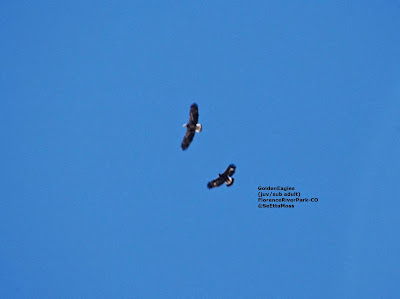 These young eagles are either juveniles or sub-adults (difficult to distinguish here) and they appeared to be practicing flying maneuvers they will need as adults as they flew circles around each other, sometimes coming quite close, as they might do during breeding or to engage a competitor.